A one hour long urban hike to Terminal 1 at 2 AM (don't ask) and an incredibly uncomfortable "nap" at the arrivals hall at the Dubai Airport until 6 AM was a very rough welcome to the city. We were cranky. We were tired. 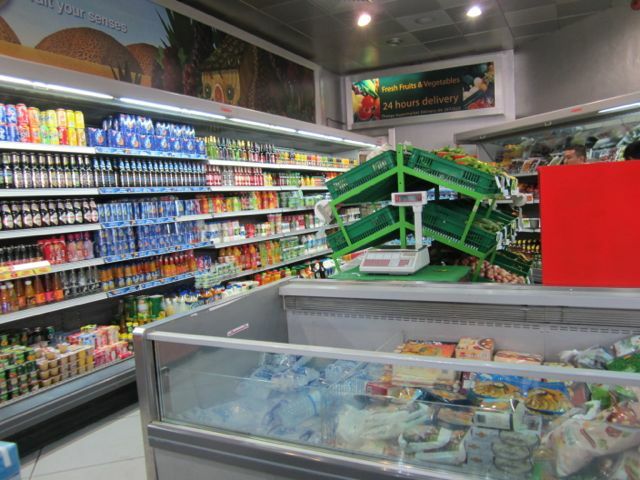 We were not so excited about being in Dubai for 22 hours anymore... until we stepped into our first super market. Holy hell there's good food in Dubai! We had such a great time devouring this city, we just wish we had a little more time and way bigger stomachs to handle all of Dubai's deliciousness. 1. Eat a few snacks at the local supermarkets before breakfast. The morning consisted of two stops at a couple of local supermarkets. There are tons of supermarkets all over the city and this simple fact already livened us up a bit. We tried one of the date milkshakes and got enough sugar to bounce around for an hour or two before our big breakfast. 2. Sign up for a breakfast at the Sheikh Mohammed bin Rashid Center for Cultural Understanding. We signed up in advance for this pretty cool breakfast that they only do on Wednesdays at the SMCCU. 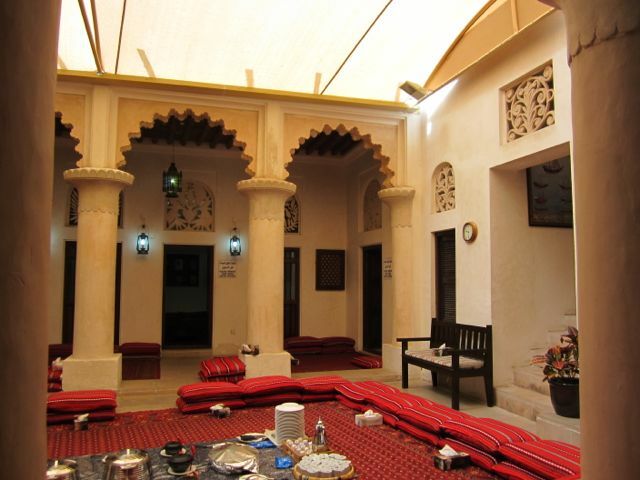 The Cultural Center feeds its guests a traditional Emirate breakfast and the wonderful hosts then answer any and all questions from the audience. The purpose is to promote an open dialogue regarding the local culture and traditions. They explained how, in the UAE, women are free to wear whatever they want, many just choose to cover up as a personal preference plus it helps prevent sunburn. We also learned that husbands need to have their wife's permission to marry a second wife and that becoming pregnant before marriage lands you (and your kid!) in jail. Apparently jail in the UAE is quite posh though and they take good care of you. Another interesting fact about Dubai is that this year Ramadan, the fasting month, is during the hottest month and you can't drink water! We had a few small cups of delicious saffron and cardamom coffee followed by a feast of lemon chickpeas, home made pancakes with a creamy cheese and honey, local bread and a traditional noodle dish. Not a bad start (finally!) to our already long day. 3. Lunch up at the mall. Any mall! We decided on the Mall of the Emirates for our next food stop. We walked around Dubai a bit and eventually the 100 degree weather got the best of us so we decided to run and hide in the mall for a while. We're both allergic to malls -- we hate shopping! -- but the heat was just unbearable. We were on a mission to get sushi (hadn't had it since February) but were distracted by so, so many things inside this gargantuan place like: penguins, american food chains, indoor slopes for snow skiing and way too many stores. 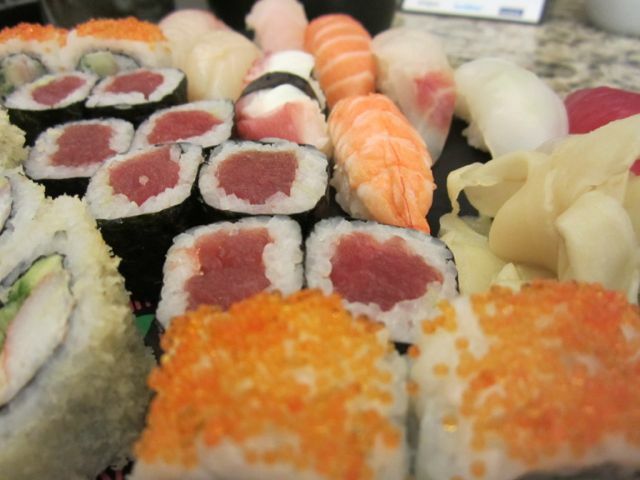 We had a whole tray of sushi and we each got a pot of loose leaf green tea... heaven. For dessert, we headed to another spot within the mall that specializes in chocolate: Galler owned by a Belgian chocolatier. 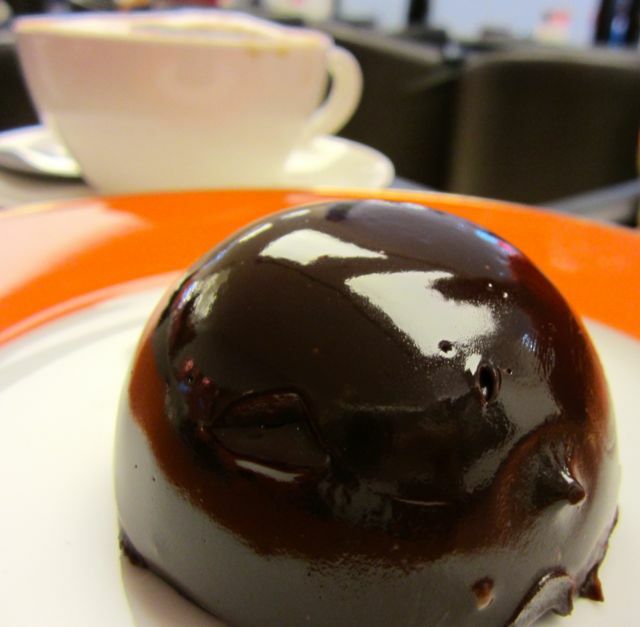 A rose dark chocolate cake, a chocolate dome thing and two coffees later, we were stuffed! 4. Call up Al Bait al Baghdadi restaurant to order Iraqi Masqouf. Then go there and eat it! 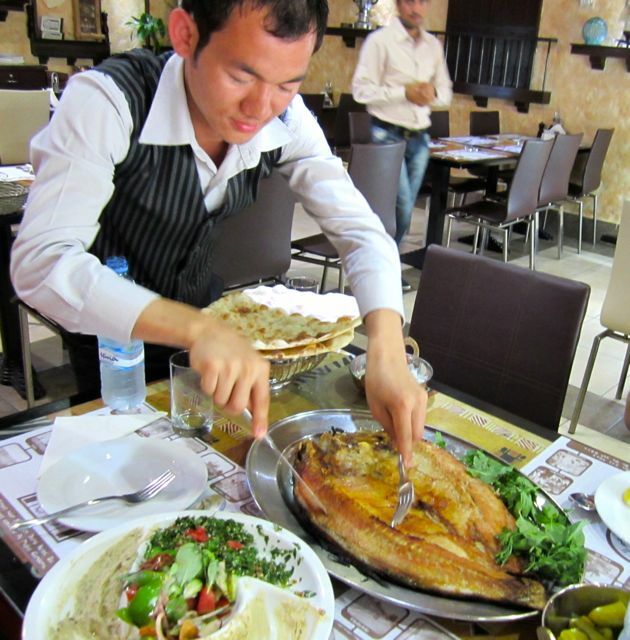 Masqouf: a phenomenal way to eat fish! We had never had Iraqi food before and after reading about it on this great Dubai foodie blog: www.iliveinafryingpan.com, we decided we absolutely had to try it. 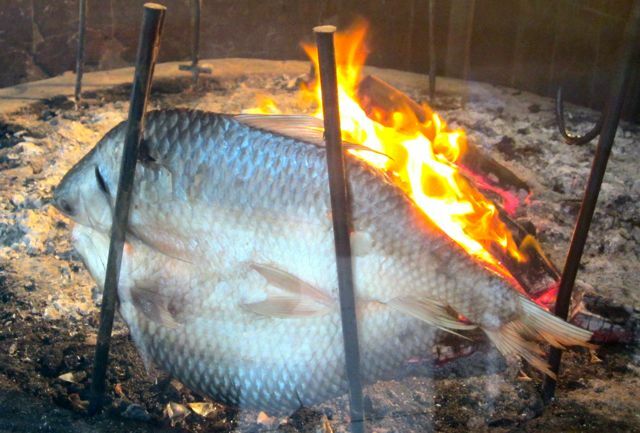 Masqouf (apparently pronounced more like "masgoof") is an amazing fish dish: the fish is cut open in a long half, salted for a few hours and then slowly cooked by the heat from wood embers. Order the fish by the kilo (three of us stuffed ourselves with a 2 kg order -- that's 4.5 pounds!) and eat up. They served the fish with amazing pickles and hummus, baba ganoush, tabouli and fatoush as side dishes. Oh and before the feast, we had a complimentary dal (lentil) soup that we loaded with fresh squeezed lemon juice. At the end they give you cardamom tea (for free!) to finish it all up. What a dinner! Well, if you still have time or an appetite after all that -- wow! We went straight to the airport after our delicious Iraqi dinner to catch our flight to Sri Lanka. With all that wonderful eating, we were able to sleep as well as one can sleep on a budget, red eye flight. Cheers, Dubai! Way to redeem yourself with your wonderful, eclectic, diverse, fresh, delicious grub!